As Low As $0.210 ea. Folded Size: 4 1/2" x 8 1/2"
Looking for a napkin to suit your banquet or formal event? Then custom printed linen-like napkins are your answer. Thicker and softer than your average napkin, linen-like napkins look classy without the cost. 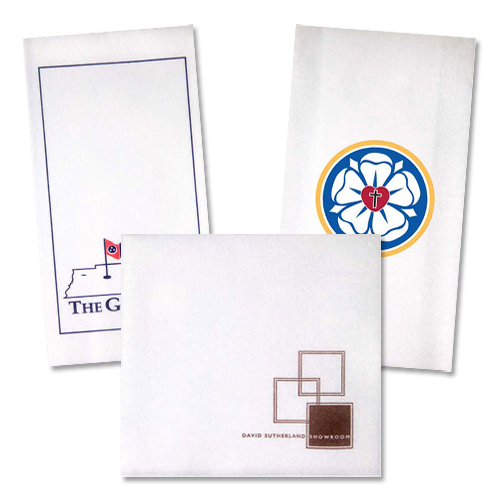 Imprint a any text, logo, or custom graphic on a napkin to promote your business or event. Dinner guests are a captive audience what will notice an promotional napkin as they wait for and eat their meal. Not having a sit down meal, well don't worry we also offer smaller linen-like napkins that are great for serving appetizers and cocktails at any event. Linen-like napkins are available in 3 different styles, which are dinner napkins, beverage napkins, and guest towels. If you are looking for a napkin that has a touch of class and fancier than what you typically find, linen-like napkins are what you need. Linen-like napkins are great for events like weddings, conferences, benefit dinners, awards dinners, wine tastings, and more. Don't need linen-like napkins? We have many other styles of napkins! Some of these styles include 3 ply napkins, 2 ply napkins, beverage napkins, advertisement napkins, promotional napkins, printed napkins, and more! 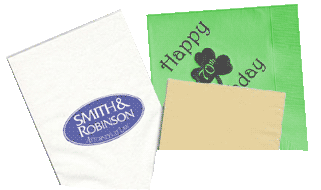 From facial napkins to dinner napkins, we have what you need when it comes to personalized napkins! Wedding napkins can brighten up and add a quality feel to any wedding! Choose from one of our styles to the right or call us at the number above to learn more about our custom printed promotional advertisement napkins! For more information on the types of custom printed dinner napkins we offer, feel free to give us a call at the number above!